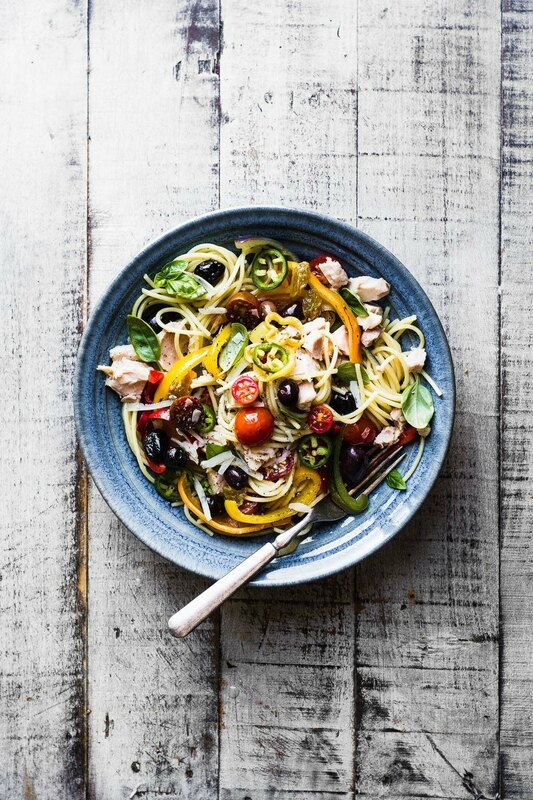 Spaghetti Peperonata with Tuna and Olives is a rustic Italian pasta that's an inexpensive, healthy 30 minute weeknight meal. Add about a tablespoon of olive oil to a large skillet and sauté the onion for a few minutes until it softens. Add the garlic and cook, stirring, for a few minutes more. Add the peppers and cook for about 5-7 minutes, until they are glossy and softened. Add the raisins or currants, olives, and tuna to the pan. Cook the pasta just until it reaches the al dente stage. Reserve some of the cooking liquid and then lift out the pasta straight into the pan with the peppers, bringing along a little of the cooking water with it. Toss everything gently together, adding half the cheese and a little more pasta water if it seems too dry. Toss until the cheese has melted. Serve topped with the remaining cheese. Garnish with some fresh basil if you like. I always do.